Back in December of 2017 I found Burstcoin by hopping through random YouTube mining videos. I was curious on the current state of mining because of the hype around Bitcoin hitting $20,000 and the popular of Ethereum and others. I use to mine bitcoin back in the day when it was less then a dollar and i kinda got back into it with dogecoin when it first got popular but, since then my IT focused from desktop support to server support so intern my homelab shifted too. I found burstcoin while on a break at work, then after work when I got home I went into my stash of random computer parts and started adding up hard drives and raid cards. It turns out that if I used a raid card I had 21TB of raw capacity just laying around. The 21 TBs is a mix of desktop, server, NAS, hard drives with a mix of SATA and SAS interfaces. 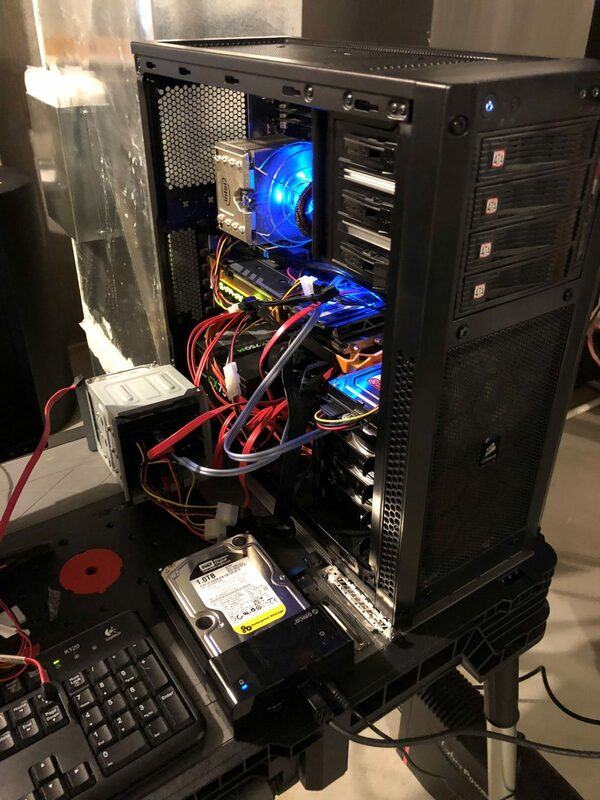 The drives ranged from 1-3 TB in size, I also had an extra raid card with passthrough laying around to so I cobbled together a server system with 12 hard drives and started ploting drives. RAID Card: LSI 9240-8i RAID Card – supports SAS drives and offloads all hard drive actions from the CPU to card. I also included a USB 3 card just incase i bought some USB drives to expand the Burstcoin mining. The “gaming” cooler was added to the system from when it was an ESXi host. When I originally built the system to be a ESXi host, my wife and I lived in a townhouse and her office was on the other side of the wall as this server. The standard Supermicro cooler basically had 2 speeds, barely moving and full speed. So when ever the temperature went up slightly, the CPU fan would ramp up to full speed. Needless to say after a full work day of that my wife requested me to make it quieter. One trip to Microcenter and my server looks like a gaming rig. This rig was to establish if the mining calculators online lined up with the real world results. With this build there was a couple downsides. I started looking at the server, my random parts and plotting options. I found that there was couple of options to plot and mine on GPUs and I had a R9 270X laying around. The problem was, as you can tell from the photo the 16X slot was blocked. I went on Amazon to buy a PCI Express to USB adapter. Unfortunately, Since the idea with the PCIe to USB adapters are for miners who are trying to put as many videocards in one system as possible. So almost every option on Amazon was a 5-10 pack…..and I needed 1. So I bought the highest rated single unit option. The best one…. failed and it melted the slot. 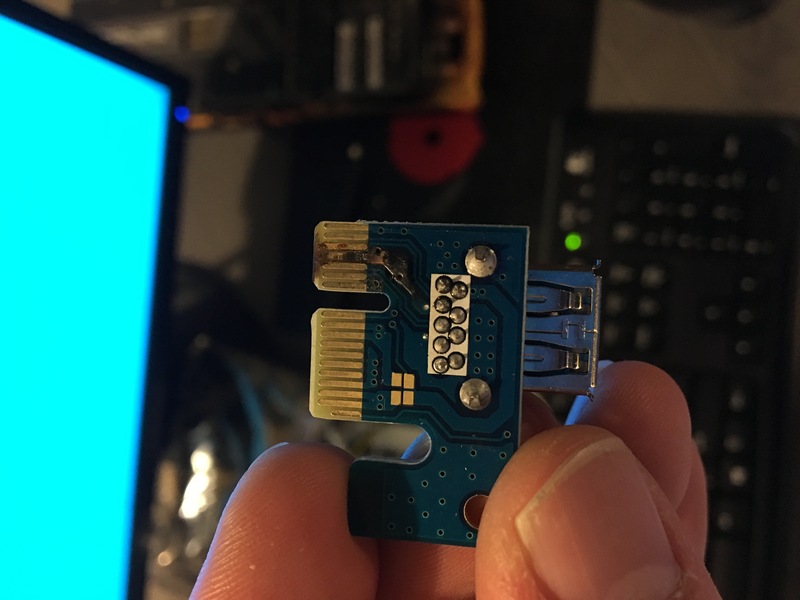 To Amazon’s credit the refunding me my ~$10 for the adapter, $50 in amazon credit for the motherboard it melted, and pulled the part from Amazon. But I was faced to rebuild the rig again. At this point I was worried because half of my drives were SAS drives that needed to be controlled by a RAID card and most (real) raid cards don’t work on Desktop systems. Luckily I still had an i7-950 CPU with an Intel DX58SO motherboard. I remembered back to my system builder days. Where a LSI 9240-8i “work” on that motherboard. I used quotes on “work” because it wasn’t reliable. At the time when both the motherboard and raid card were new/current. To get the combination to work specific versions bios and firmware had to be installed for it work. 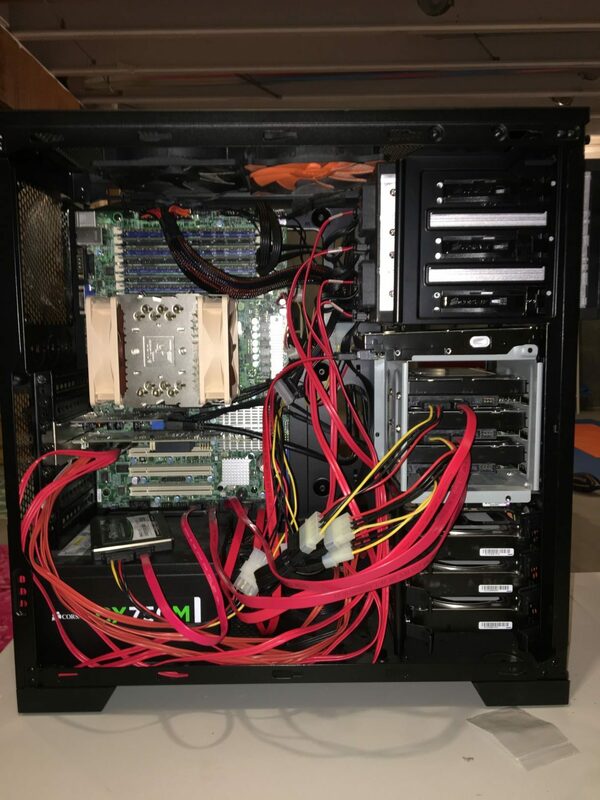 Since over the last few years I’ve been using the raid card in a server and the desktop CPU and Motherboard as a desktop computer. The Bios and Firmware on both items were fully up to date. So I crossed my figures and started rebuilding the system. To my surprise the RAID card actually worked in the system. 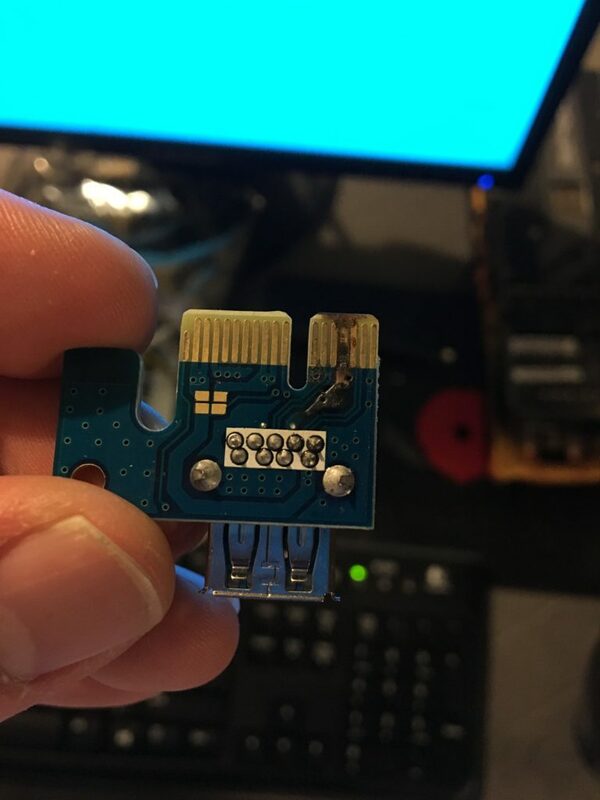 Luckily, the videocard wasn’t damaged in the melting adapter incident. So i finished ploting all the drives and started GPU mining burstcoin. The Intel I7-950 is a powerful CPU but, unfortunately it’s just old at his point. The CPU doesn’t support AVX or AVX2 so mining on the GPU was literally 8 times faster then using SSE on the CPU. The downsides of mining rig 1.0 and 1.5 were power and expand-ability. The AMD Opteron and the i7-950 are bigger wattage CPUs and since neither CPU supported AVX/AVX2 I was going to have to power a video card to get good mining speeds. Which running a rig in this fashion goes against one of the original intents of the currency. Burstcoin is suppose to the green alternative to bitcoin. The increased power of this rig is not as bad as GPU mining any currency like bitcoin or Ethereum, but it still felt like a waste. The second issue was expand-ability. Both systems were released before USB3 was a thing, so neither system had it built in. I added a USB 3 card just in case I added USB drives, but even so that card was in a PCI-Express 2.0 slot so I still couldn’t scale above a few drives before the PCI-Express bus would be maxed out. Around March i found the WD drive (center in the picture) and added it the rig over USB 3 and it was fine for 1 drive, but the bigger is that the solution didn’t scale. This rig ran fine from January 18 to July 2018. I decided to take advantage of a Best Buy sale on 8TB USB hard drives during the forth of July and a Lenovo Tiny computer I got for free and a build a new rig to replace this guy. An upcoming post will detail the new build.